It always takes about three days into January before I start researching spring break trips - anyone else?? I actually love snow, but the negative temperatures in Chicago make it slightly less enjoyable. Jeff's busiest time of year is actually January through mid-February, which always reduces my spring break plans to just dreams, but hey, even thinking about a beach helps! 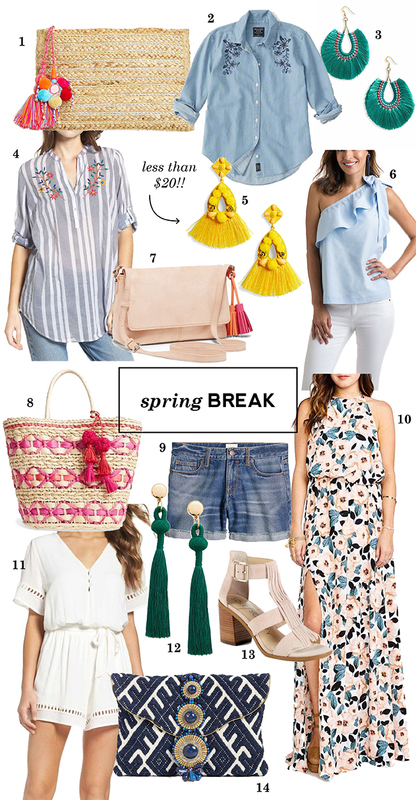 To help get me through the gloom, I started shopping for fun, warm-weather pieces. What can I say, they're just more fun than sweaters right now! So far I've only brought home this bag and these earrings, but I see some cute dresses on the horizon ;) A word to the wise: if you've got your eye on a fun bag, snap it up early! My favorite tote from last spring / summer sold out in just days, and I've missed out on bags in the past because I didn't move fast enough. In case you don't believe me, the bag I bought is already sold out in the color I bought! Don't worry, I found the navy here.